On 26 July 2017, an event examining SUN Movement progress and partnerships was held at the Center for Strategic & International Studies. The event included a panel of experts working in or with SUN Countries and concluded with questions and answers from the audience. The SUN Movement has helped secretariats begin to track progress on nutrition and nutrition action plans and now they have started to gauge how much money is going to nutrition. We think that SUN can really be credited with getting this moving. 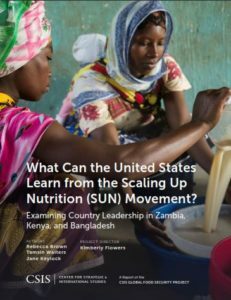 The new report, “What can the United States learn from the Scaling Up Nutrition (SUN) movement? 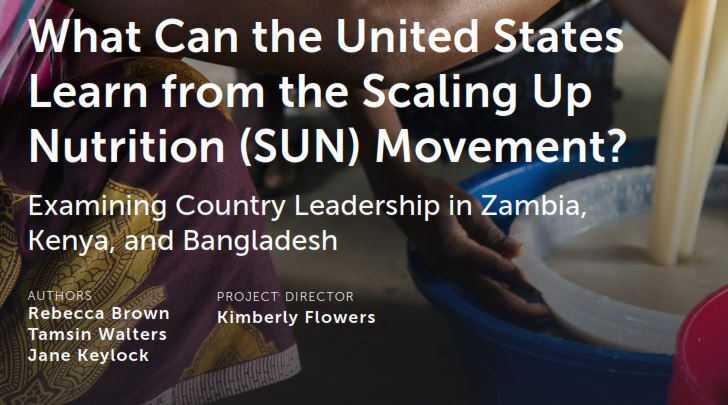 Examining country leadership in Zambia, Kenya, and Bangladesh” draws from SUN progress observed in three countries. It’s analysis focuses on reducing the prevalence of stunting in countries targeted by the U.S. government global food and nutrition security initiative, Feed the Future. The report ultimately furnishes recommendations for Feed the Future to improve its engagement with country-level nutrition policies and aligned resources.